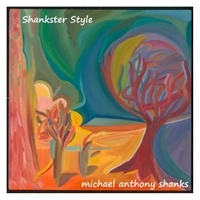 Houston Music Reviews.com - Michael Anthony Shanks "Shankster Style"
The opener “Freak Out Acid Blues”, while having the word “blues” in the title is actually what I'd call a funk tune. The vocal performance is all over the place and not very pleasant. The song is somewhat salvaged by decent keyboard and guitar solos. If I were Michael, I wouldn't open the CD with this tune as it had quite a few shortcomings in the vocal delivery...or was trying to be off on purpose, whichever one it was, it doesn't work. “Lone Star Gipsy” is probably the best performed on this record. To me it sounded like an attempt to capture the Gipsy Kings song structure. It was flamenco-y, as it seemed a bit apparent that Michael doesn't really know flamenco that well and was just paying a tribute to the genre by playing some flamenco inspired runs. Still, it was a competent performance and probably the best written tune on the record. I loved the opening on “Reverberate the Sound” but then the tune devolved into a schmaltzy street bard song fare...think Thursday night at Sherlock's, something that plays while you clank beer bottles. To me it just ruined a perfect opening and had me yawning midsong. The songs continue pretty much in this fashion, with “Shipwrecked” being a completely pedestrian affair, “Foggy City Morning” kinda jazzy but not quite, and “The Salamander” seeming like an attempt to capture Santana-like feel but falling short. While failing to capture me as an audience I think that there are good moments on this EP, but it needs further production and development. Michael seems to be better suited as a sideman guitarist that sings backup vocals, and I think he'd be perfect in that role. Taking the lead spot gets all the heat and as in this case you can almost fall flat on your face.